We're spotlighting some of our BBC employees from around the country– including military veterans and spouses– in recognition of NAA's RPM Careers Month! Continue reading to learn more about Michael, community manager. How many years did you serve in the military? I served for 20 years. What made you decide to continue your career in the military field after your time as an active duty service member? The ability to continue serving our country by supporting the men and women who are on active duty. At the time, working in the government housing maintenance industry, allowed me to stay in the Air Force world I had called home for 20 years. How long have you worked for BBC? I’ve worked for the company for 7 years. What do you enjoy most about your job and working with military families? Knowing you’re helping our military family’s transition to a new assignment, providing them a wonderful place to live, while reducing a small part of the stress in their daily lives is rewarding. 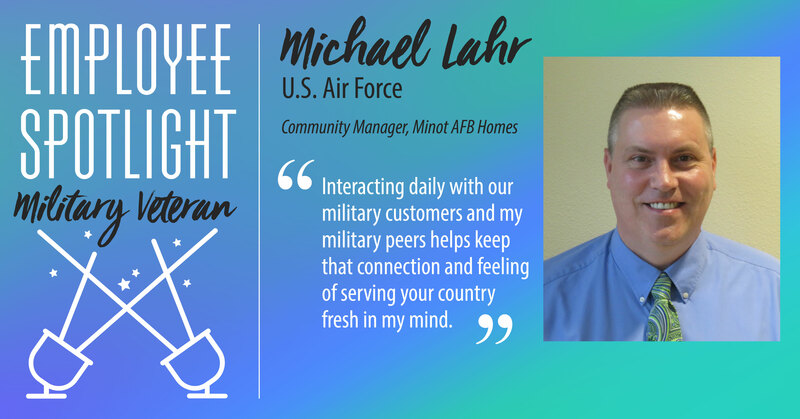 Interacting daily with our military customers and my military peers helps keep that connection and feeling of serving your country fresh. It’s easy to get up each morning and start your day knowing you’re helping military families while building a great community for them. 2019 Balfour Beatty Communities - Residential. All rights reserved.